Abdel “AJ” Fernandez worked under industry legend Alejandro Robaina for many years before moving to Nicaragua and starting his dream of producing his own cigars. He has been a big success ever since with his self branded blends, some Internet retailer exclusive blends and most recently, some B&M exclusive blends. Tony actually just reviewed the San Lotano Oval with is AJ’s newest B&M Exclusive. 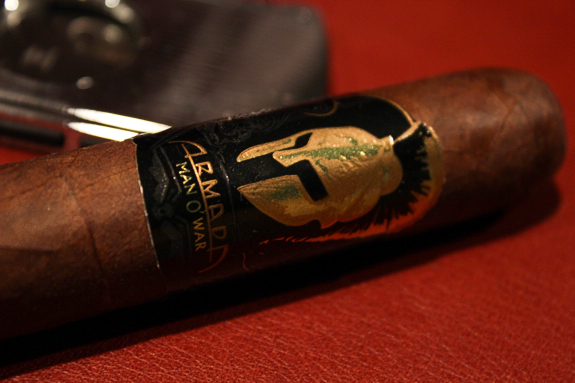 The Man O’ War Armada is available exclusively at Cigars.com and Cigarsinternational.com as with the other Man O’ War lines. 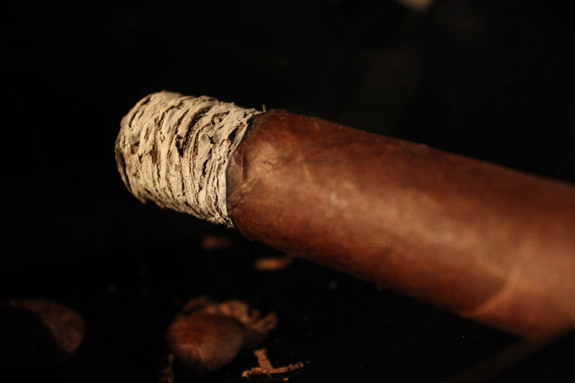 The other blends in the series include the Ruination, and untitled Man O’ War, the Virtue, and the Puro Authentico. 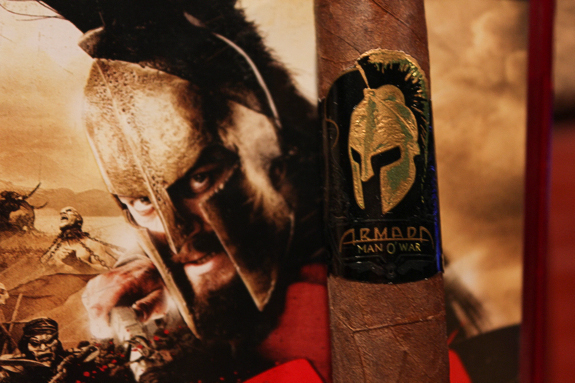 The Armada is the special edition of the Man O’ War line and priced rightly so for that purpose at a hefty $20 per cigar. The boxes of these cigars are packaged in impressively made chests of 32 cigars that also include a humidifier and a hygrometer. 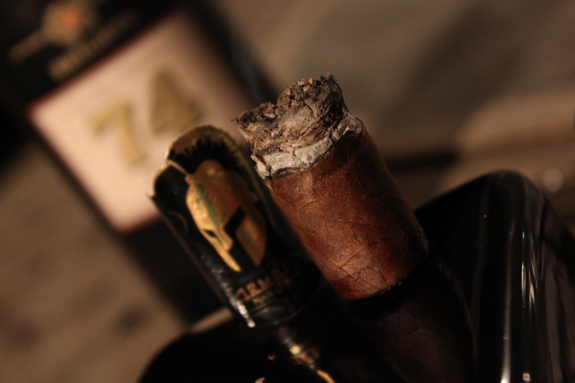 Currently, the Man O’ War Armada is only available in a single vitola, the Toro Grande. There are also two limited edition boxes that come with a few other cigars and include an Armada. These two boxes contain the Armada in a Perfecto and Box-Pressed Robusto Vitola. The Ecuadorian Sumatra wrapper is extremely rare and all the tobaccos used undergo an extensive fermentation and aging process before being put into any cigar. 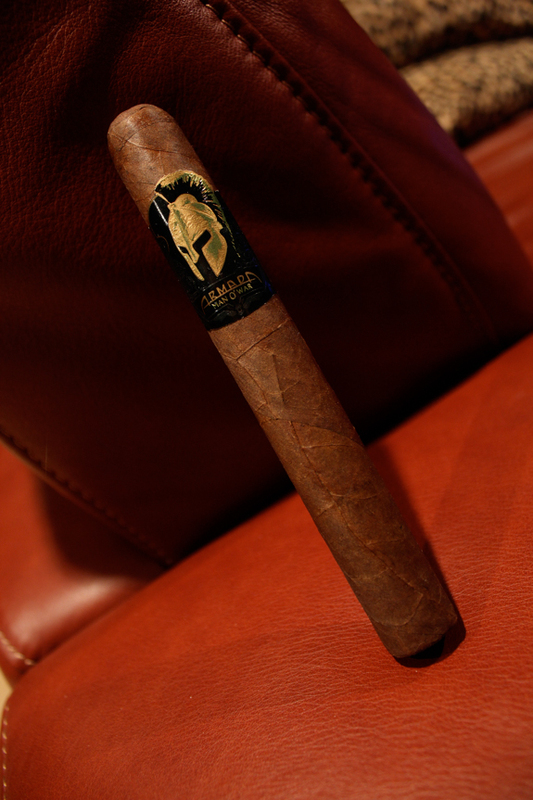 The fillers in this cigar are ligero from AJ’s farm in Nicaragua, specifically the Esteli and Ometope regions. 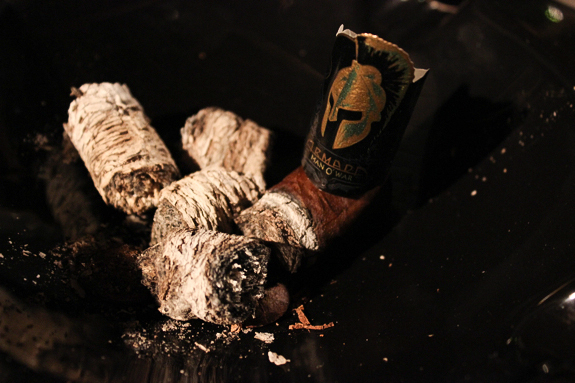 The Armada is also produced in limited quantities of only 10,000 of this cigar each year. All these key features come together to justify the higher price tag. Now all that is fine and good, but if it doesn’t have a delicious profile and excellent construction to back it up, most people probably won’t buy it right? So let’s see if it has that important last piece to the puzzle. •	Did I mention how slow this thing is burning?!?! 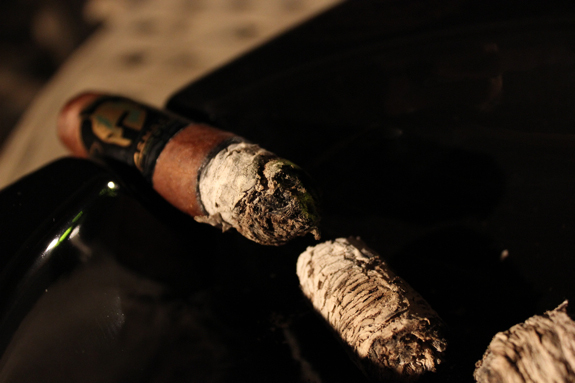 •	Did I mention how wonderfully balanced this cigar is?!?! I’ll admit I had my reservations going into this cigar. I haven’t had too many AJ cigars that wowed me but I also haven’t had any of his newer ones. 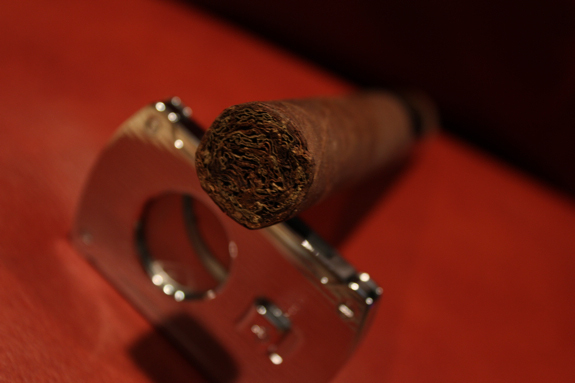 Also, with a $20 price tag, this cigar set the bar high from the start. I have to say I’m not at all disappointed and it was $20 well spent! 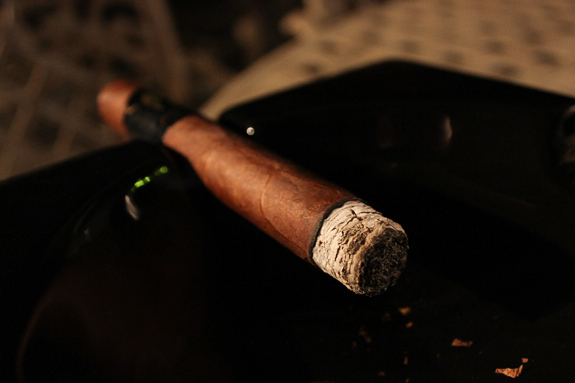 The flavors in this cigar were excellent and the balance of them all with incredibly spot on. It kept me on my toes and going back for more to see what flavor would be the dominant one on the next draw. My only real complaint here might be the draw, which was a bit tight even after a few pokes with a toothpick. But the construction on this cigar was something to admire and AJ Fernandez’s skills in the blending department definitely shined through! The price may be out of range for most people to purchase a box but I think it’s definitely worth getting a few to sit in the humidor for a special occasion. 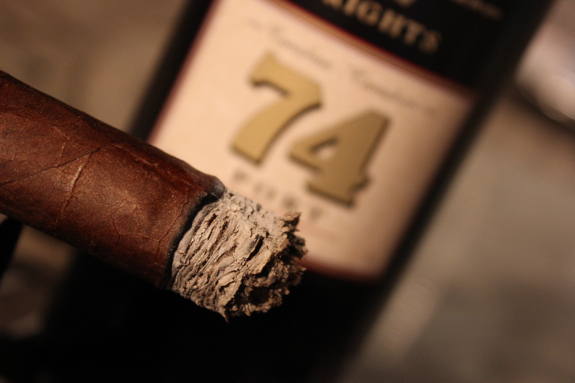 Take note that this cigar does have some kick and power behind it, so pick your pairings well and don’t give it to a new cigar smoker as they may not be able to fully enjoy the complexity and balance that this cigar offers. Perhaps this will be a contender on our 2011 list?? I was pretty excited when I found this bottle at my local liquor store. More Port wines are produced in Portugal and it’s fairly uncommon to find them produced by many other wineries. I’ve only come across a small handful that are made in Canada and this one happens to be from one of my favorite wine regions, Niagara, Ontario. 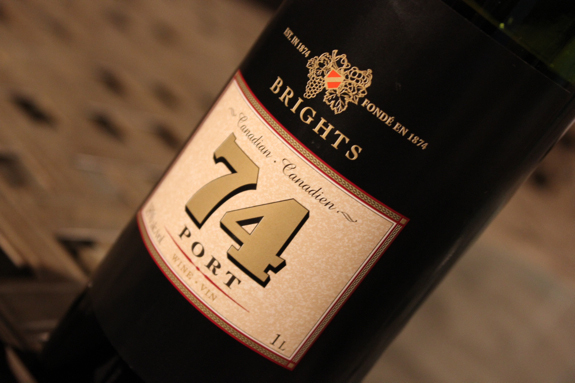 The winery is called Brights and this particular bottle is called Canadian 74 Port. I fully plan to visit the winery on my next road trip to the Niagara region and see what else they have. Why you ask? Well, because this port is fantastic! It has a light start with cherry, current and blackberry fruit notes along with a woodsy touch. But the real treat is the finish, when it builds in body and gives you a full heavy red wine flavor, similar to the Merlot wines I’ve come to love from the Niagara region. It’s incredibly tasty and I will definitely be buying more, especially at a super cheap price tag of only $12 even after all the ridiculous liquor taxes here. But the question is, did it pair well with the Man O’ War Armada? You’re damn right it did! the light fruity start complimented the flavors of the cigar extremely well and the full smooth finish contended the full body of the cigar perfectly. 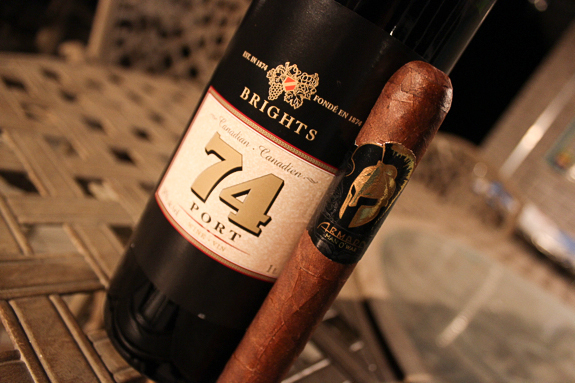 This was a powerful cigar but I find a good port wine really helps counteract any nicotine effects you might feel. I’m not sure there is a better pairing for this cigar but if I had to choose I might pick out a smooth aged scotch or possibly a strong cuban coffee with a couple sugars to combat the nicotine. A full stout might also work well here. I am worried about the draw You mentioned.That is my biggest pet peeve. Man, what a great review! I really enjoyed how you grouped your discussion points. That said, a $20 cigar is just not in my budget, not even my “special occasions, once a year” budget. 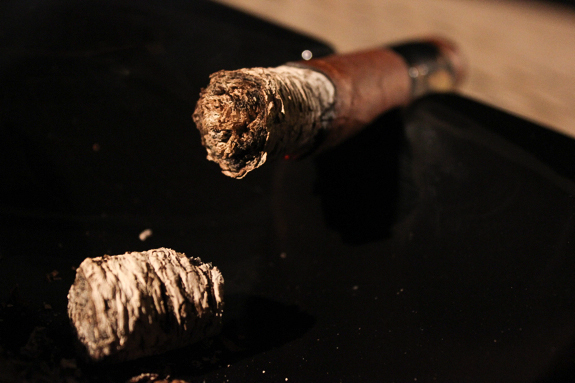 Maybe someday … and by then, maybe my palatte might stand up to this kind of stronger cigar. Thanks! Hey buddy great review, I really like AJ’s stuff I’m a big fan of the Ruination stick and the Puro, hope I will get to try one of these someday. Keep up the great work. I have a Puro that I haven’t lit up yet but I hear good things! Have you tried it yet? What did you think? I actually smoked the Virtue today, that’s a great Connecticut cigar. MoW line is pretty solid from end to end it seems! Loved the Puro Dan, great little fire cracker of a stick, lots of flavor, great burn and for the size lasted me nearly an hour. Not a morning stick for me end of the nighter. I haven’t tried the Virtue I’m really excited to try one I love Connies that have some nice flavors hope I can find one in my area. Thanks again. Great review Daniel. I picked some of these up in a primo sampler at a little under $10 a stick. Looking forward to smoking em and havent read a review yet so glad I picked em up. Cheers! Thanks Joey! That sampler is exactly how I got one of my Armadas. It was a great deal with the Cigar Caddy to boot. Come back and let me know what your thoughts are on the armada when you get a chance to light it up! Good Work D! I am envious and need to track some of these down… Just can’t afford them right now….It is on the list though.